(Reuters) - Police have a 24-year-old suspect in custody in the slaying of reputed Mafia boss Francesco "Franky Boy" Cali in New York City, authorities said on Saturday. Police apprehended Anthony Comello in New Jersey on Saturday and expect to charge him with murdering Cali, the New York Police Department's Chief of Detectives Dermot Shea told a news conference. "This is far from over. We are at the beginning stages of this investigation," Shea said. 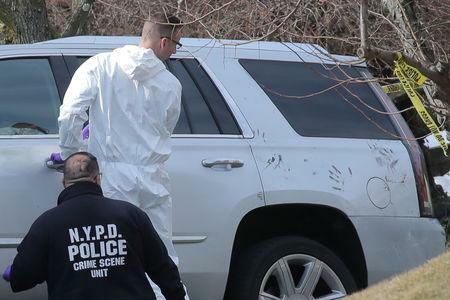 Surveillance video of the killing showed a man, allegedly Comello, crash his car into Cali's parked SUV, drawing Cali outside in what might have been a ploy to lure him out of the house, Shea said. Shea declined to say if Comello had a criminal record, but said he had "crossed paths" with the NYPD. Comello's truck was issued a parking summons in Staten Island on the day of Cali's murder, Shea said. Police are still investigating the motive behind Cali's murder, he said, including whether it might have been a domestic altercation or a mob-related killing.